As an adoptive parent, I look for books and movies to share with my kids that present adoption in a positive manner. I want to instill confidence in them. It has worked for the past nine years. My oldest has started to notice that not all media portrays adoption favorably. He laments “why do ‘they’ make adoption seem like a bad thing, when it is not?” I assure him that adoption IS a good thing, and “they” just don’t know it. Last week he and I were going through his school papers. He jumped up in unexpected fury over a paper in which he got a 20/20 grade. He was aghast that he would score so high. Okay– parent radar up! I probed the subject and learned that it was an interactive questionnaire about a book the teacher had read aloud. I scanned his answers and found that foster care and adoption was the prevailing theme. Hmmm. I questioned him whether he liked the book or not. He did not like the book because it didn’t have an ending, there were no sequels, nor would there ever be another book. At this time he is shouting and stomping out of the room. So I googled the book, read the summary, and ordered a copy on Amazon. I also emailed the teacher out of fear that he may have shunned the book in school and I wanted to remind her of the perspective he has on this subject. (I don’t know if it is good, bad, or both that people in our community forget that our kids are adopted). His teacher apologized for not being sensitive to his feelings and was curious what my review of the book would be. 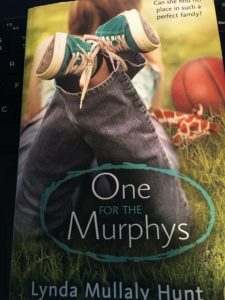 “One For the Murphys” is the story of a 12 year old girl who is abruptly removed from her mother’s care and placed in a foster home. The fostering family is new to the fostering system so there is a learning period on both sides. Through the book, the reader uncovers truths as the characters themselves learn these truths. What once seemed like an impossible situation, grows into something to believe in. I won’t give away more, but I now understand why my son was affected by this story. I remind myself that even children who are adopted at birth will feel a sense of loss of the past and uncertainty for the future. This book was a “Battle of the Books” title last year. I can see why– it is very well written and appeals to middle school readers and older as well. After I was done reading it (all in one day! ), my son asked why I read it. I told him my truth– seeking to understand how he felt. He remarked: “it’s a good book, isn’t it?” Ah, the pre teen years; the emotions go up and down.